Great one today, starting at around 9,500′ just below Brainard Lake, the Boulder Trail Running Breakfast Club broke into two groups at the start, with a handful taking the ~11-mile round-trip route while the rest of us (maybe a dozen?) headed off for the 18-miler. Photos from today, taken by others. The turnaround point was the summit of Pawnee Peak at 12,943′. The 9.3 miles took 2:40 and I was hurting the whole climb up. Since I found most of the 3,500′ climb too steep to run, I was roughly mid-pack and hiking as quickly as I could without totally red-lining. But, at the turn-around, I felt good and was able to hang with the front runners the entire return, finishing within just a handful of seconds of the first guy back to the cars, the speedy Dan Gorman, who recently challenged his cycling friends to a race to the top of Flagstaff Mountain, with him on foot and them on bikes. Yeah, it wasn’t a race a but is was nice to run easy and still stay with some talented guys who were working a bit. Today’s run was beautiful, challenging, and the weather cooperated, with sunny 60s most of the run. Going into it, however, I was kind of wrecked. It was my longest run of the week (by time) and included the most climbing and technical terrain. I went into it with little sleep and the remnants from one too many white wines night. [Totally different and less objectionable than “white whines,” like “why are all the minorities taking our jobs and running faster than us?”.] It brought my weekly mileage total over 82, a heavy volume for me at any point but all the more exhausting with the altitude and recent heat. And it was my 5th longish effort in just eight days, with training runs of 15, 17, 13, 21, and now ~18 miles just since last Saturday. 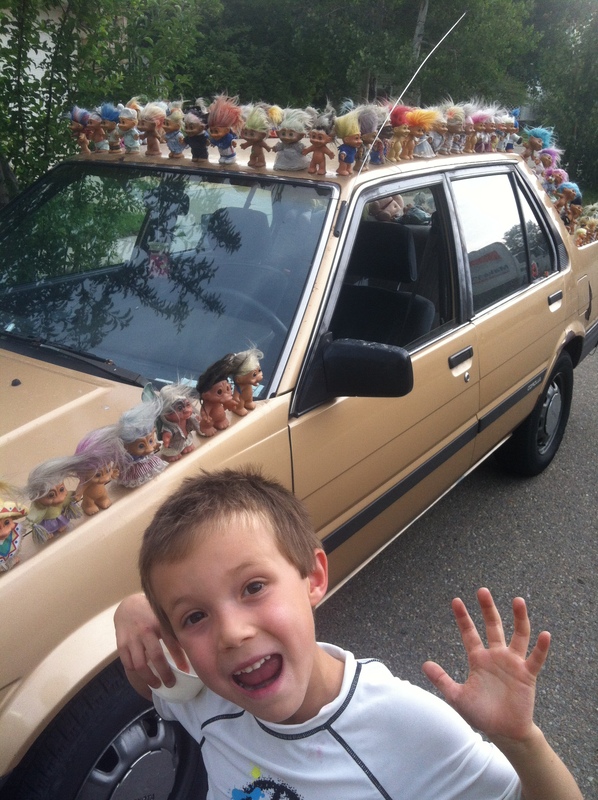 In what would have to be largely unrelated news, Sagan saw a car covered with trolls yesterday. « Caribou Ranch + Do I really need to rest yet?